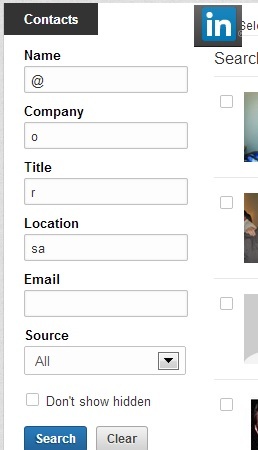 The new LinkedIn Contacts functionality is simply amazing! It opens up never-before possible people sourcing explorations, and is available (albeit still very buggy) for all personal accounts, whether paid or basic. The syncing with other accounts possibility is quite like the Talent Pipeline in some ways. (More about it later). Okay, so Linkedin came up with a new feature including app, in US store only btw, so that is annoying. Also to get your linkedin contacts synced with the new feature you have to refresh, refresh, refresh, refresh, refresh, refresh, refresh, refresh, refresh, refresh and at some point you think everything is synced. No, it says all your contacts are now synced, but the actual contact list is not.. not yet. So if you go back to contacts, only a few are in there..
To solve that you have click connections in the side menu: again and again and again and again and again and again and again and again at some point it will only add another 40 per refresh. Funny thing is during this process of synchronizing you’ll see next to “all contacts a different number presented that on top of the contact list… usually a difference between 10-14 connections… Btw if you just wait the machine keeps on running his sync, it is just not as quick as me hitting the refresh button, expecting to get it all at once. Having all this said. Now exploring the feature: big plus, Tagging possible per group of people, finding people in your network based on email addresses, like e.g. give me all that has listed ebuddy.com email or have a hotmail account etc. The nicest thing about this, I can finally work through my 30K contacts again. My screen doesn’t look like yours and I have upgraded to the new LinkedIn contacts. In addition, I am unable to group email if I do a search on my contacts. Is there a way around this?? I am sorry, I don’t know… this seems like a question to LinkedIn Customer Support. There are so many things that are currently broken. Click get started and it will ask you to sync with gmail/yahoo/outlook etc… You can choose which, if any, you want it to sync to. Once you do that, your contacts link will show the new features like Irina displayed in the screenshot.